Follow us on Facebook to be the first to hear about upcoming dates and locations! 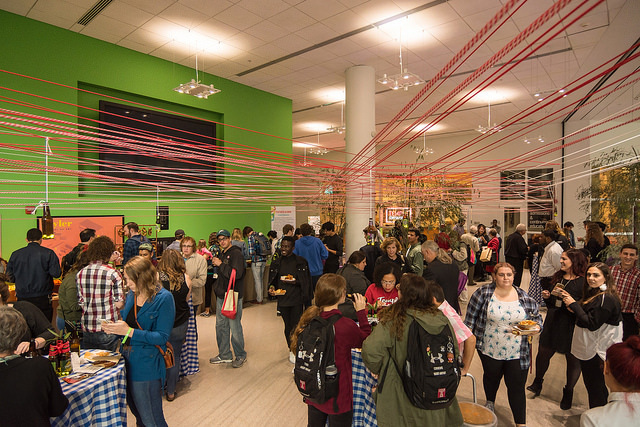 Join us this season for Crafts & Drafts, happy hours bringing together creative professionals, Tyler and Temple alumni, and members of the arts community in the Philadelphia region to start conversations, make connections and exchange ideas. • Happy hour specials on food and drinks for attendees throughout the evening! • Share your business card or artist opportunities with other attendees for a chance to win a drink on us! Sponsored by the Tyler School of Art Alumni Association. Fall Edition • Friday, October 13, 2017 @ 5-8 p.m. Sponsored by Victory Brewing Company and the TUAA, our first happy hour on the season will take place at the Art Market at Tyler! All who register online for this happy hour receive two drink tickets! Winter Edition • Wednesday, December 13, 2017 @ 5-8 p.m.
Winter '17 Tyler graduates who register online for this happy hour receive one drink ticket! Spring Edition • Wednesday, May 2, 2018 @ 5-8 p.m.
Spring '18 Tyler graduates who register online for this happy hour receive one drink ticket! Summer Edition • Wednesday, July 18, 2018 @ 5-8 p.m.
A new addition to the Crafts & Drafts line up, this midsummer event is an opportunity to reconnect with friends, colleagues and alumni over games and drinks in Frankford Hall's beer garden!